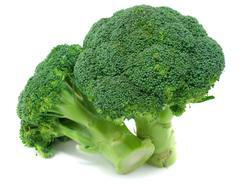 Broccoli matures in 60 to 90 days, depending on the time of year and the variety planted. Harvest broccoli heads as soon as they reach maturity. Ideally the buds on the heads should still be small and firm, not swelling or starting to open, but are still edible even when blooming. Do not pull the plant after harvesting the first, main head. Sideshoots (small broccoli heads) will form at the points where the leaves join the stems. One plant may produce for as long as 3 months in the late fall or winter thanks to ongoing production from side shoots. For larger heads, provide generous spacing. Planting closer together will produce smaller central heads. Warm weather, especially in the spring, may encourage bolting (going to flower). Batavia, Hybrid Large 6–8" main head plus side shoots on this very early broccoli. 18–24" tall. Plant 12–18" apart. Belstar, Hybrid Large 6–8" main head followed by plentiful side shoots which will continue all winter long. Later than Packman. 18–24" tall. Plant 12–18" apart. Bonanza, Hybrid Large 9" main head followed by a generous crop of large (5" across) side shoots. Productive and flavorful. 24–36" tall. Plant 12–18" apart. Broccolini (Aspabroc), Hybrid Easy-to-grow baby broccoli produces dozens of tender, tasty heads with an asparagus-like flavor. 20–24" tall. Plant 24" apart. Calabrese, OP Medium-sized 3–6" main head followed by numerous side shoots for months afterward. 24–30" tall. Plant 12–18" apart. Packman, Hybrid Tasty large (10-inch) light blue-green main head followed by lots of side shoots which will continue through the winter. 18–24" tall. Plant 12–18" apart. Waltham 29, OP Delicious heirloom variety with plentiful side shoots. 18–24" tall. Plant 12–18" apart.